The Oregon economy is improving, but lottery revenue is not keeping pace with income growth and consumer trends. Oregonians’ entertainment spending roughly mirrors income growth, but their spending on lottery -related activities has not returned to pre-recession levels. The state recently released its 2014 economic forecast, and revenue from lottery games and programs continue to fall short of expectations—more than six million dollars below projections. According to industry experts, increased competition accompanying gaming expansion is in part to blame. As the number of casinos have increased, for example, competition has ensued and squeezed the profits of existing establishments. Additionally, the market for gambling, which includes casinos, slot machines and lottery, among others, have dramatically increased in the last two decades, and the market may be nearing saturation. As the novelty of expanded access wears off, related revenue will likely level off. As one would expect, current trends are negatively impacting companies directly tied to the gaming industry. 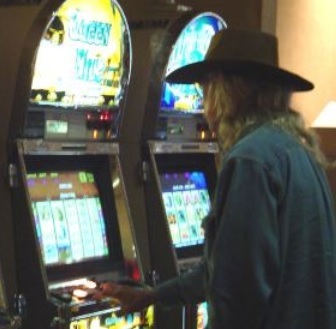 Commercial and tribal casinos alike are reducing operations due to falling demand and revenue. This June, for example, Ceasars Entertainment will close one of Mississippi’s largest casinos, laying off 1300 workers. The Atlantic Club Casino Hotel in Atlantic City was shuttered earlier this year, costing 1600 jobs. Five of New Jersey’s remaining casinos reported operating losses for the latest nine-month reporting period. The world’s largest slot machine maker laid off seven percent of its workforce due to decreased revenue in North America. The lackluster results from the gaming industry aren’t just impacting related business. Many states use lottery and various gambling proceeds to fund education and other programs. In fact, such funding strategies were often used to help sell state residents on the merits of expanding gaming programs and commercial businesses. But in Ohio and Missouri, for instance, related funding has taken a hit as projected revenue from gaming has fallen short. There may be many factors impacting the gaming industry, but lower than projected revenue growth amid grand promises of budgetary windfall raise questions as to whether declines are permanent and systemic in nature or temporary. Either way, current trends may lend support to those in opposition of further expansion in states like Oregon if they continue to hold.